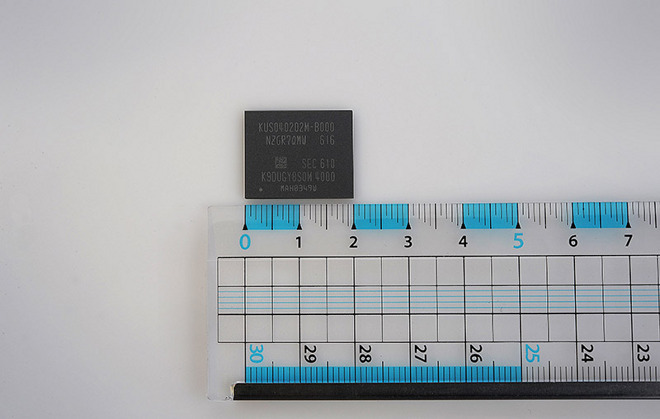 Designed for thin-and-light laptops and other space constrained applications, the PM971-NVMe incorporates 18 separate chips in a single ball grid array package with a volume that is about a hundredth of a standard 2.5-inch SSD card, and one-fifth the surface area. The package combines 16 48-layer 256-gigabit V-NAND flash chips, a 20-nanometer 4Gb LPDDR4 DRAM chip and an in-house controller. "The introduction of this small-scale SSD will help global PC companies to make timely launches of slimmer, more stylish computing devices, while offering consumers a more satisfactory computing environment," said Jung-bae Lee, Samsung's senior vice president of Memory Product Planning and Application Engineering Team. According to Samsung, the new SSD's NVMe interface surpasses transfer speeds supported by the current generation SATA 6GB/s protocol. Sequential read and write speeds reach up to a respective 1,500 megabytes per second and 900MB/s using Samsung's TurboWrite technology. As an example, the PM971-NVMe can transfer a 5GB movie file in about three seconds, or download it in six seconds. The PM971-NVMe SSD will be produced in 512GB, 256GB and 128GB capacities, and is expected to ship out this month. Samsung did not specify OEMs that might be interested in purchasing the new SSD module, but Apple with its penchant for thin-and-light laptop designs is likely on the short list. Aside from iOS device components, Apple looks to Samsung for a variety of Mac parts, including current issue SSDs. For example, Apple quietly upgraded the original Toshiba SSD modules in its MacBook Air lineup to Samsung units in 2011, a switch that ultimately trickled down to other MacBook lines. Recent rumors suggest Apple is planning to introduce thinner and lighter 13- and 15-inch MacBook Pro models in late 2016, a product line lauded for its performance capabilities. While speculation points to parts crossover from the 12-inch Retina MacBook, like butterfly key mechanisms, it is possible that the company plans to include Samsung's speedy, and diminutive, storage chip in the new design.